Three Rivers currently has five public gardens* which were designed and planted by Redbud Garden Club members. These gardens are in highly prominent sites, mostly along Highway 198 (Sierra Drive), so that the community and visitors can benefit from their beauty. About 9 years ago the club began reviewing its historical garden projects with a closer focus on their sustainability, since plantings in earlier projects didn’t always survive the harsh climate extremes of Three Rivers. In 2004, the Club was asked to develop a Fire-Safe Demonstration Garden of Native Plants at the CAL FIRE Station. We teamed up with a number of local groups and individuals to plant a garden that is beautiful, sustainable, and friendly to the environment…and that features magnificent foothill plants. We were fortunate to have help from Melanie Keeley, a horticulturist of Sequoia National Park, who had the expertise to guide us in correct plant choices and planting methods. The Club has developed a Garden Watcher program monitor sites to ensure their continued health and vitality. Watchers also do the fine-tuning, like pruning, so that the gardens remain community treasures as well as educational tools and inspiration for the home gardener. Our goal is to have gardens maintained and funded by the agencies whose sites they are on, although the Redbud Garden Club continues to support some gardens where this is not entirely possible. The Post Office is a hub of Three Rivers where many residents have post office boxes and visit daily. The lovely native plant garden, originally planted in 1996, was extensively reconfigured and redesigned in 2007, at which time a formal dedication of the garden was held in memory of long time Redbud Garden Club member, Jean Darsey. The native trees, shrubs and wildflowers in this garden, initially planted in 2005-2006, brought the site into harmony with the natural landscape nearby and reduced the expensive water consumption on site, a prime concern for the Veterans Memorial Board. The Club was fortunate to have labor provided by Mountain Home inmates who removed large areas of overgrown plants so that new plantings could be established. So many redbuds, deer grass and other plants successfully reseed themselves here that this garden is becoming a nursery for seedlings that we transplant to other newer gardens. A second phase of the Memorial Building Garden was installed in January 2011, and a final, riparian phase is being discussed. The Garden Club, partnering with the County and fire personnel who staff this station year round, designed and planted this native plant garden in January 2009. Designed for the Library’s 20th anniversary in 1997, the garden of mature native plants has been enhanced by the addition, in 2008, of “Our Place Playground” on an adjoining lot, also owned by the County. The playground was conceived by community parents and its shade garden was designed and installed by the Garden Club, with the parents’ help. These two gardens are linked to the elementary school by a woodland path, well used by classes and individual students. The Club is looking at future planting sites along this path. The Garden Club developed a Fire-Safe Native Plant Garden on the newly developed building site in 2005. Over time the garden has been expanded to include two memorial gardens, one with shaded picnic table and dry stream bed, and a more irrigated area with a lawn near the fire personnel’s quarters. Cal Fire is only seasonally staffed, therefore it has maintenance lapses and irregular irrigation that reinforce to us the value of native plants in tolerating difficult conditions. A weed abatement garden enhancement project in February 2011, using 25 tons of river rock and boulders, further beautified the garden while decreasing maintenance needs. This project received an award from the Cal Fire District. Plants that were put into our community gardens did not always match the original landscape design, some have died and been replaced, and many new ones have been started from divisions or seedlings. It is time to inventory what is in the gardens, not only so we know the breadth of the plant palette we have, but to aid in our signage project. A focus in our community gardens this year is plant identification signs because we think garden visitors will be more likely to use the plants in their own gardens if they can readily identify them. Will be repairing or moving existing signs, as necessary, and installing new signs where there have been none. The Tulare County Board of Supervisors is underwriting much of this project. We don’t want the community gardens to be a secret! A brochure to be distributed at events such as the the Artist Studio Tour and Gardens Tour of Three Rivers and through real estate offices will help visitors to our town as well as locals find and enjoy the gardens. The club will be assisting this local non-profit organization that provides quilts to sick children at Children’s Hospital in Fresno. Last year they gave out nearly 2,000 quilts. Bring donations to our December holiday party that can include yardage, batting, thread and yarn, in addition to financial support. The Garden Club members nurture a wide variety of plants for sale and distribution at a plant sale held in conjunction with the Redbud Arts and Crafts Festival each May. Volunteers grow plants from seeds, cuttings and divisions. During the plant sale the community is given educational information about how to grow and integrate the plants into home gardens. 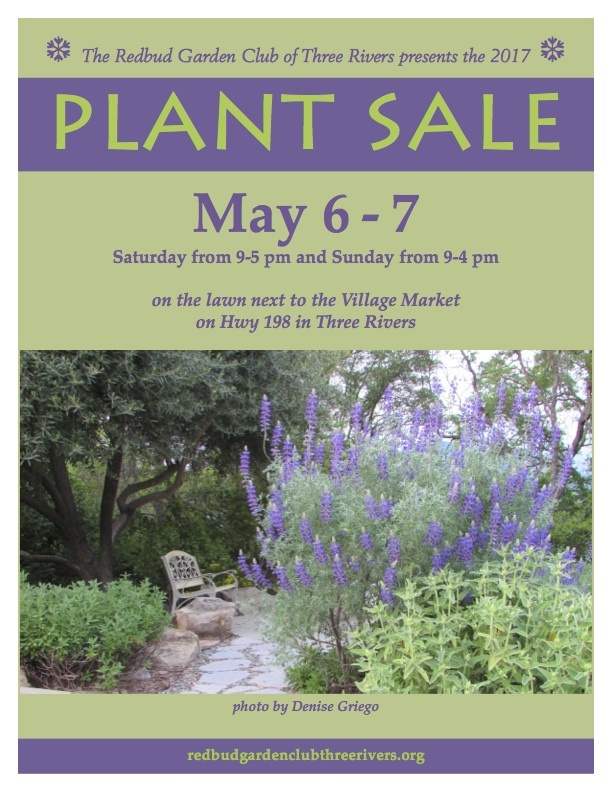 Proceeds from the plant sale go to support other Garden Club projects, such as the Public Gardens throughout Three Rivers. The Garden Club members assist as docents for this fund raising activity sponsored by the Three Rivers Union School Foundation. Local beautiful gardens are chosen for this spring garden tour.